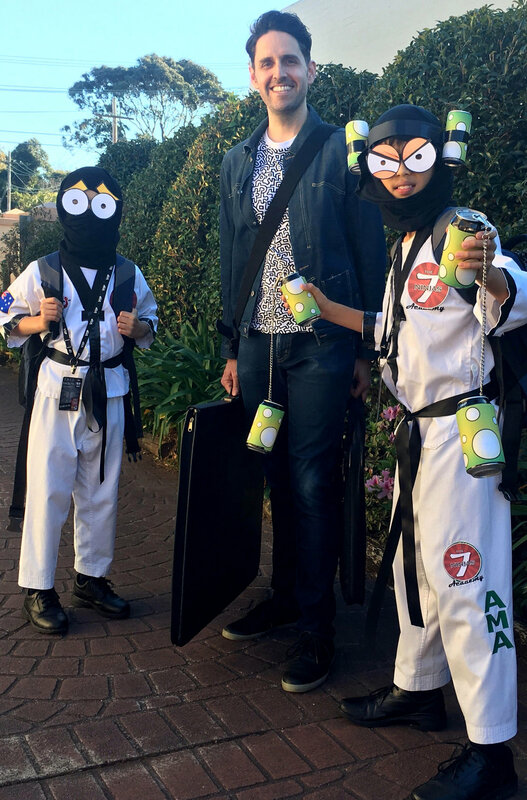 Book Week crowds can be a little wild, so I always travel with my personal bodyguards. If you mess with Burpy or Fred (from my book Epic Fail Tales: Snow Man and the Seven Ninjas), you'll regret it! No autographs! Happy Book Week everyone. Keep Drawing! Keep Writing!! Keep Reading!!! Farty, Ninja Number 2, literally. This ninja is a real gas, so whatever you do, DO NOT pull his finger. He's the unofficial leader of the Seven Ninjas. Who picked him? He did! Picking is what he does best. And don't make him angry. His revenge will be swift, without mercy and very, very slimy! This guy! He's the spotlight-loving star of Epic Fail Tales: Snow Man & the Seven Ninjas. He's totally buff and totally clueless. After a disaster on stage leaves him doubting his abilities, it's up to the Seven Ninjas to whip him back into shape again, by any means necessary. And I mean means. Those ninjas are nasty! EPIC FAIL TALES: SNOW MAN & THE SEVEN NINJAS - COMING SOON! It's official! After nearly 3 years in the making, the first book in the Epic Fail Tales series hits shelves on the 1st of February 2017.